As fans nationwide celebrate the 80th NFL Draft, April 30-May 2, the NFL will bring unprecedented free fan experiences, flag football competitions, musical entertainment, autograph sessions and more to the host city of Chicago, the NFL announced. The Draft will take place at Chicago’s historic Auditorium Theatre of Roosevelt University, and for the first time, will expand outside to adjacent parks. Congress Plaza will host Selection Square, home of the 32 team Draft tables; Grant Park will be transformed into Draft Town presented by Oikos Triple Zero, a free, three-day outdoor interactive fan football festival spanning the size of 15 football fields. 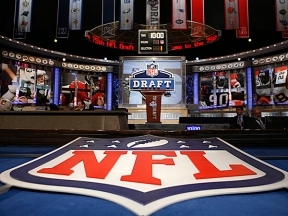 The 2015 NFL Draft will be televised nationally by NFL Network and ESPN. Fans should visit nfl.com/DraftTown, follow @NFL on Twitter and use #NFLDraft for the most up-to-date information. Fans in Chicago are encouraged to share their experience using #DraftTown. Grant Park’s famous Buckingham Fountain will be lit up in the colors of the team that is on the clock during the Draft’s first two nights. Draft Town hours of operation are: Thursday, April 30: 4-10 p.m.; Friday, May 1: 4-10 p.m.; and Saturday, May 2: 10 a.m. – 7 p.m. For more information on Draft Town attractions, events and prohibited items, visit NFL.com/DraftTown.